Crisp Clean Shadow! Simple & easy trick. Sometimes I love a crisp clean eye but it can be hard to achieve the look by free hand so here is what you do. Take a piece of regular tape and apply it to the outer corner of your eye in an upward position (slanted). 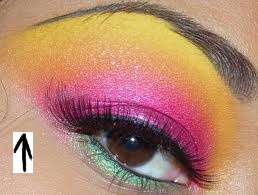 Apply eye shadow as you normally would and after you are finished, remove the tape. You will then have a crisp clean edge!